Summer is, without argument, the most magical season. Long days, warm nights, endless possibilities and freedom. Summer brims with nostalgia and potential, all wrapped up in the warm glow of the long sunlight evenings. I pack my days and nights full with people and parties and travel and salt and sand and laughter until before I know it months have blurred into one long humid afternoon. Exactly the way that I like it. Recently I had an unexpected weekend all to myself, which never happens, and had me giddy with the possibilities. Would I go to the beach and lay in the warm sand for hours? Would I buckle down and get to all that work I probably should tackle (unlikely)? Should I curl up on the couch with the dog and marathon Gilmore Girls while polishing off the last of the salted caramel sauce? As I sat at my computer that Saturday morning checking the weather and sipping my coffee it occurred to me that this free weekend might be the perfect opportunity for spontaneity. A little Googling and a few phone calls later it was decided, I was going peach picking in Brunswick County. 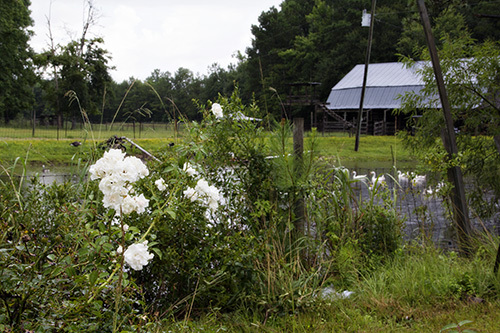 Brunswick County stretches from the Cape Fear River to the border between Carolinas, making it the southernmost county in the state. Its 1,050 square miles include the Brunswick Beaches- Sunset, Ocean Isle, Holden, Oak Island, Caswell, and Bald Head Island. Driving through Brunswick County you’ll find farmlands, fast growing communities, beaches, riverfront, and plenty of golf. Founded in 1764 it was named for Brunswick Town, a settlement and major 18th century port. 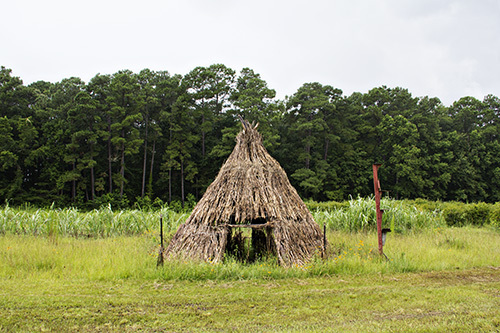 Brunswick Town is now a colonial ghost town, but it was the first settlement on the Cape Fear River and thrived until it was destroyed during the Revolutionary War. The county seat is Bolivia, and Brunswick County borders Columbus, Pender, and New Hanover to the north and Horry County, South Carolina, to the south. 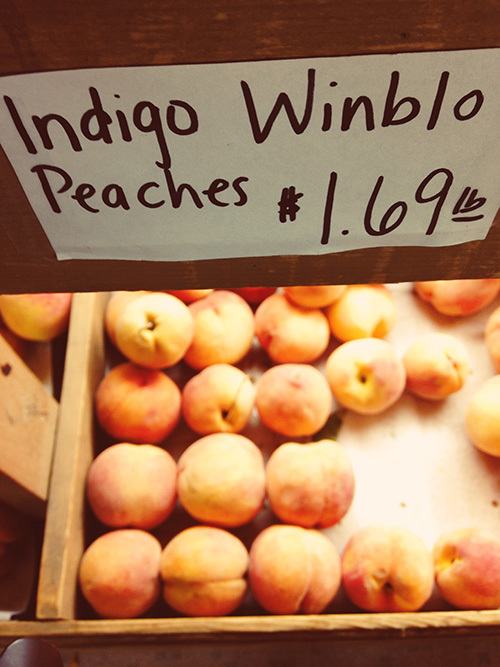 I’d been thinking that my late summer installment of Tasting North Carolina should focus on the stone fruits currently flooding the market, and had been toying with the idea of visiting a peach farm. 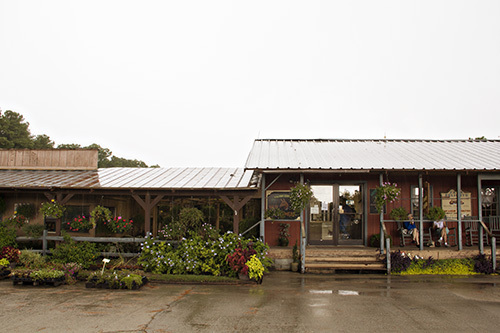 That Saturday my friend Brandy and I drove the hour south to Calabash to visit a farm that (according to the web) had pick your own peaches, berries, figs, and more. It sounded like heaven! It sounded like fate! I should have known better! 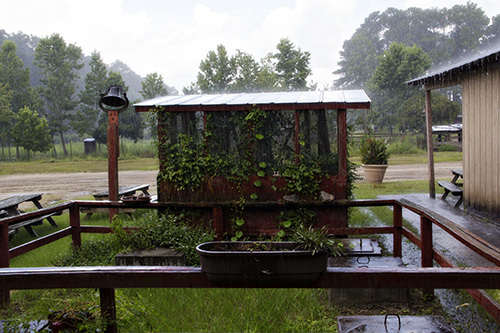 As we pulled into the farm the skies opened up, letting loose the kind of rain that only a week of unbearable heat in the South can elicit. We scrambled inside and started to make arrangements, only to discover that they a) only offer pick your own in the early morning (we got there around 11.30) and b) don’t ever pick your own peaches, just blueberries. A double whammy of disappointment. Thankfully Brandy and I glass-half-full type people, especially when we’re on a spontaneous road trip, so we bought some peaches, green peanuts, and hot sauce (made right there on the premises) and headed on our way. 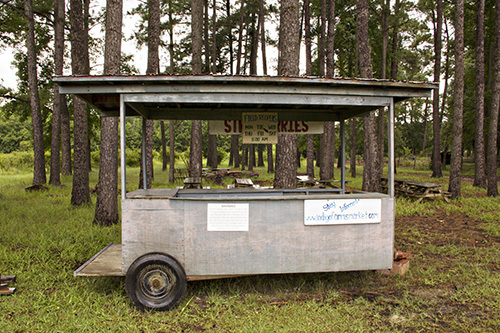 Our original plan of visiting the beaches were dampened by the rain, so we headed back on home, happily chatting as we drove about how we were going to spice our boiled peanuts. The real highlight of the trip happened in Leland, just over the bridge from Wilmington, when Brandy spotted a massive alligator on the side of the road. And because this was a day of spontaneity I turned the car around and we pulled out our cameras, sprinting to find it. 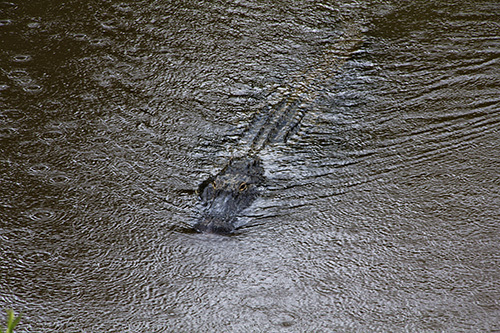 As we approached he swam from one side of the marsh to the other, towards us, allowing us an up close look at easily the biggest alligator either of us have seen in the wild. The moral of the story? Things may not always work out as you expect them to, but in the end there will probably be alligators. Begin by making your caramel sauce. In a heavy skillet melt the sugar, stirring constantly. Sugar will clump and then melt, continue to stir as it turns an amber brown. Cube butter and stir into sugar until combined. Remove from heat and add cream. Stir rapidly until fully incorporated. Add in vanilla extract and allow to cool. Slice peaches in half. Brush each half with coconut oil. Grill peaches flesh side down for 5-6 minutes or until tender. Serve hot with ice cream and drizzled caramel sauce. 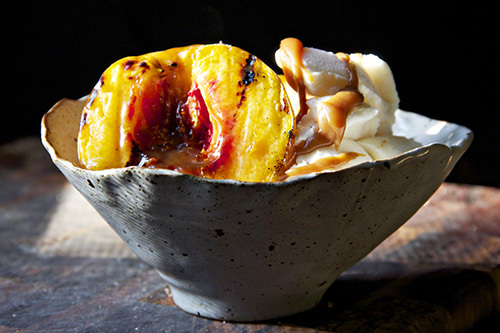 Grilled peaches with vanilla ice cream is one of my favorite summer desserts!! I will definitely have to add caramel sauce next time, because that sounds divine!